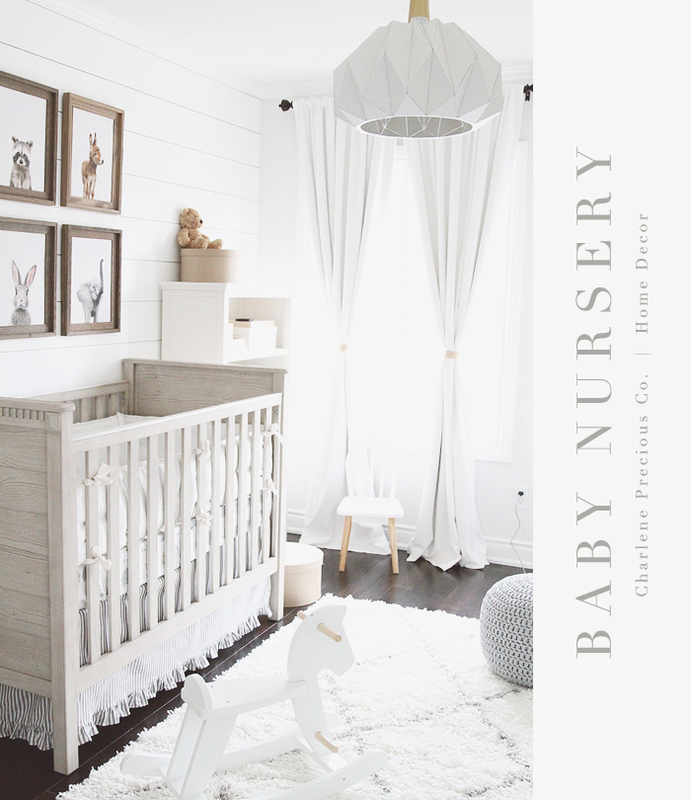 Home Decor Archives - Charlene Precious Co.
Back to the nursery series! Baby is napping so I’m squeezing in a super quick post for the nursery series :). Here’s both a decorative and functional wall we put together for hanging clothes and things. The heroes of this wall are undoubtedly the adorable cloud, whale, panda bear, and polar bear hooks that are just to die for. All purchased on Etsy, all the way from England and Israel – see ‘Shop this Look’ below for links to the shops. The elephant faux taxidermy is super cute and adds to the fun on this wall. I’m not huge on real taxidermy but these faux ones are so lovely in nurseries. The shiplap wall continues to complement and I’m obsessed with it (might put shiplap in our bathroom, too)! And down below is a toy dump hamper. Yes, it’s a hamper, but it works just as perfectly for toys as it does for clothes :). Beside the toy dump hamper is a DIY step stool that Chris put together for me, so I can reach the top of baby’s closet :P. We repurposed barnwood scraps from our basement renovation project that would have otherwise ended up in the garbage. To be honest though, it’s not the safest stool to stand on unless you were extremely, extremely careful (ha!). It loses balance. We don’t have woodworking expertise and didn’t know how to make it structurally safe. I do deem it safe for sitting though, so it’s not completely purposeless! Stuffed animals in the toy dump (puppy dog and wolf) are just starters for now to finish the look. Colton will have a growing collection of toys going in there as he gets older and I’m sure it’ll be a huge mess soon enough! That’s it for now! Enjoy, xo. Another piece of the nursery! 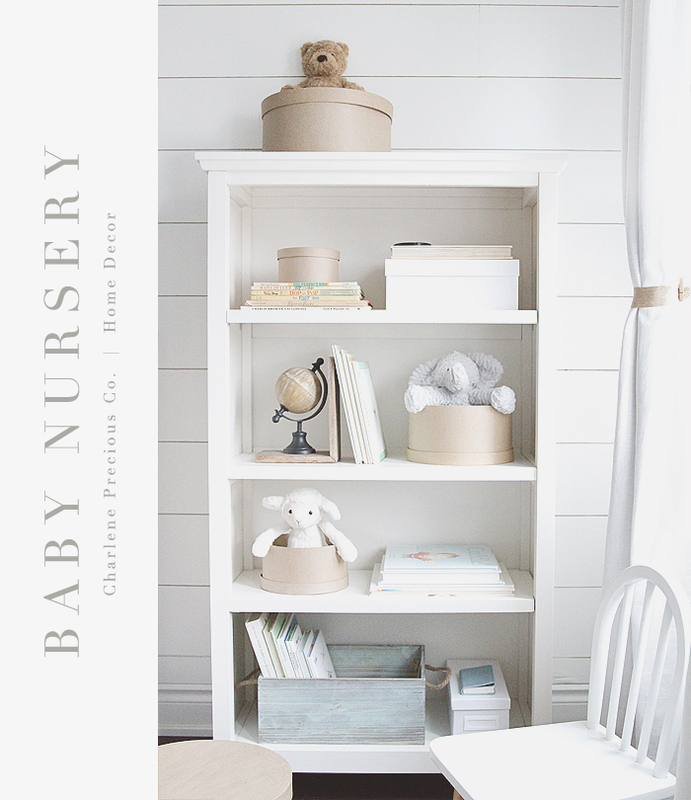 It’s been while since I’ve shared another piece of the nursery so here it is, the bookcase area :)! If you haven’t caught the nursery series so far, you can take a peek here and here. The styling of the bookcase has actually evolved a little bit more since this photo was taken but time is a scarcity these days so I wasn’t able to take a more updated photo. This will have to do! I LOVE bookcases and this one was so much fun to dress up only because it was different from the rest of the bookcases we’ve decorated and filled up around the house. It’s the only one that can be styled for a baby and that occasion doesn’t come around every day! Just 3 that I want to quickly share (before baby wakes up ;)). 1. Less is more & mind the space: Don’t overload the bookcase with things. Think of it as a wonderful storage unit but one that has to look good since it’s out for the world to see. Be mindful of space between items to create clean lines – don’t overload and err on the side of ‘less is more’. I could stockpile a lot more books than what’s in the bookcase but that’d look terrible :P. And when filling up a bookcase, don’t limit yourself to just literally books! Always complement with pretty boxes, baskets, bins, which fill the space substantially but in a neat, non-cluttered, minimalistic way; they just so happen to also work great for extra storage. 2. Decide on a tone, mood, colour scheme: You would generally want to think about an overall tone for your bookcase. Soft? Vibrant? Dark? Girly? Boyish? In our case, I wanted a soft and calm, earthy-tone bookcase, mixing colours like whites, greys, baby blues, and pastel browns together. Having this in mind will guide your shopping list and how you put everything together from your accent items to your actual books. 3. Play with book layout: The traditional way to place books in a bookcase is in the vertical upright position. But to add appeal, place some of your books horizontally/flat and then stack them on top of each other. Be mindful of the books’ spines – try to put books together with spine designs/colours that go hand in hand with each other. Might I just add that Value Village has $1.00 pre-loved nursery books that are in fantastic condition??? We picked up a whole bunch and then sanitized them. Dollars very well spent! That’ll be all for this bookcase. It’ll be a few more weeks before we take some of these books and start reading to our little guy. For now, I’ll enjoy its completely untouched state while it lasts :). Alright, I’m ready to share another part of this magical room, yay! :) This is the other side of the nursery. I really don’t know which side of the room I like better – they both make me very giddy! It’s really my new zen place (perhaps until the chaos of a newborn comes). So let’s chat quickly about the different pieces here. 1. Rocking Chair: What I love about this rocking chair is that it has the traditional arched legs vs the modern “gliders”. Not only that, the legs are made of wood, which added a nice touch and fit nicely in the room. We really wanted a traditional wooden rocking chair but the comfort is just lacking compared to modern rocking chairs, so it was awesome to find a middle ground between traditional legs and modern comfort. This piece is from Pottery Barn Kids and it’s called the Charleston Convertible Rocker. 2. Dresser: This super white dresser is the Jonesport Double Dresser from good ol’ Toys R Us. It looks fantastic and very reasonably priced. If you haven’t already noticed, I don’t love deliberately matching furniture pieces and tend to steer away from “sets”. In fact, I purposely make sure things don’t match but rather complement each other! That’s the real trick and changes the game! 3. Rustic Ladder: Boy is it ever tough to find a good looking ladder! After a few failed tries, we found one at a local store called Hearth Manor Fireplaces. This ladder was tucked away in a dusty corner and we happened to spot it. It wasn’t cheap but it had quite the beautiful rustic finish, so we took the plunge. We had to cut it down ourselves because it was a 12-foot ladder and we only have an 8-foot ceiling in this house! Other than that, I absolutely love it. Ladders are fantastic decor pieces and never fails to add character to a room :). Once the baby is able to walk/climb stuff, we’ll have to relocate this to another place in the house but ’til then, it can stay :). 4. Wall Shelves: Got these at VdeV downtown. They’re the 48 x 9″ pine shelves with small Demi Lune brackets. These shelves are super HEAVY DUTY. They weigh a ton and they are gorgeous with a finish that matched the ladder almost perfectly. 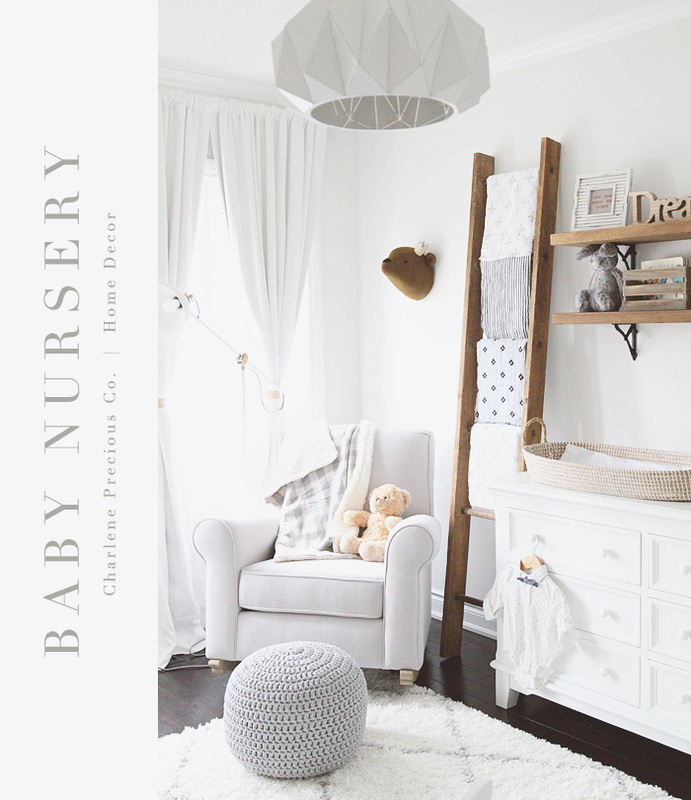 The vision for the nursery was always whites and greys with rustic wood accents to add some boyishness to the overall baby softness, so these pieces delivered nicely on the “harder” accents! 5. Crochet Pouf Ottoman: Instead of spending a fortune on a matching ottoman for our rocking chair (and also because I really hate matching furniture pieces :P), we got a pouf instead. This one’s from an Etsy Shop, Looping Home. The artisan is based in Portugal and makes all sorts of beautiful custom poufs in various colours, shapes, and sizes! It’s not the cheapest (but still cheaper than a real ottoman) because nothing is cheap on Etsy but a) I love supporting artists and b) being able to customize items, so I continue to be a huge fan of this marketplace! 6. Teddy Bear Faux Taxidermy: Also bought this super cute faux taxidermy at an Etsy Shop, Heidi and Finn Studio. They’re local in Georgetown, which made me want to support them even more. They make all sorts of super cute faux taxidermies but given the colour scheme of the room, the brown bear was the right one to go with :). Real taxidermies can be a bit creepy but plush ones are simply cute as buttons. Notice his little crown as well! So adorable. Turnaround time was also impeccable with this shop; the bear came within 2 days of me ordering! 7. Changing Basket: This might honestly be one of the most impractical things I’ve purchased for the room but am still kind of proud of it! I say it’s impractical because it’s not overly big and I’m pretty sure my little guy will outgrow it in no time. Having said that, it is just the prettiest and most unique change pad. I find the traditional ones a bit of an eye sore and couldn’t get myself to buy them, so I went with this Reva Oval Changing Basket from Olli Ella. :) I also just love the finishing touch that wicker pieces bring to a room! 8. Blanket: The blanket thrown over the rocking chair is from Indigo called the Cabin Cozy Sherpa Blanket. It’s so soft and cuddly, I adore it! Rocking chairs and couches always need some sort of a throw for a finishing touch, otherwise they look bare and incomplete :). 10. Floor Lamp: Because our ceiling light fixture is dim in nature (we didn’t want an overly startling bright light), we decided to get a secondary floor lamp in case we needed the room to be brighter for any reason. This spot light is the RANARP floor/reading lamp from IKEA. Super cheap and looks awesome. 11. White linen drapes, rug, and ceiling light fixture were covered off in my first baby nursery post here. Ahhh, my favourite room in the house to date. 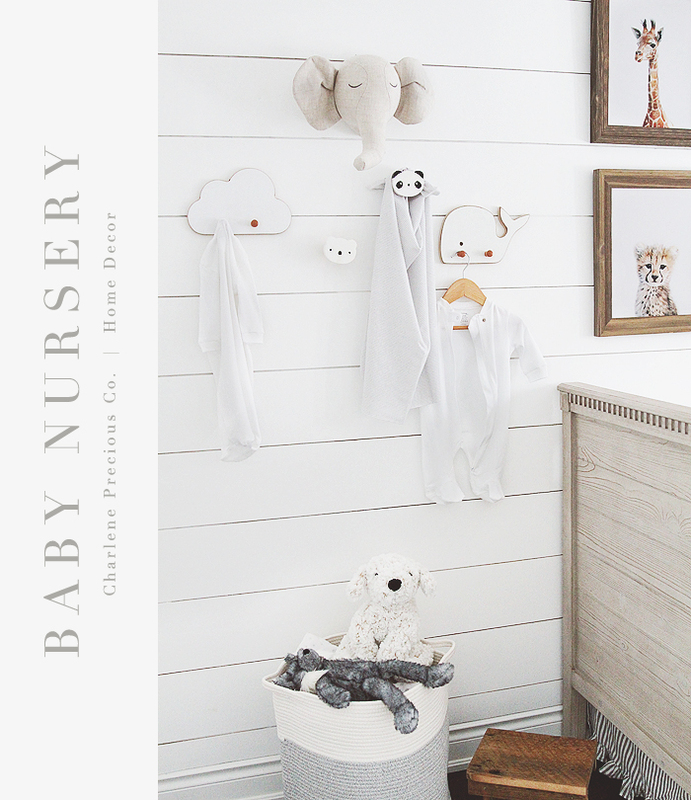 Here’s a sneak peek of our little nursery. Everything is done! I just need to upload more pictures. Aimed for something gender neutral but mostly for a baby boy. I’m obsessed! I also created a brand new blog category, “Mommy Life”! Things just got more real. Okay, here’s a rundown of what you see. Actual links to items will be down in “Shop This Look”. 1. Shiplap Wall: What a difference an accent wall like this can make to a room. They’re not super cheap but not super expensive either. They’re totally worth it though. 2. Crib: This is the Rory Crib from Pottery Barn Kids. It converts to a toddler bed, which is nice. All the bedding including fitted sheet, bumper, and crib skirt are also from Pottery Barn Kids. I might as well have lived there these past few months. 3. Baby Animal Prints: From Etsy! I love Etsy so so so much for really cool, unique handmade items. More to come on Etsy purchases in other parts of the room when I get to posting them. 4. Barnwood Picture Frames: These are from Michael’s Arts & Crafts. My favourite frames. I have them all over our house :). 5. 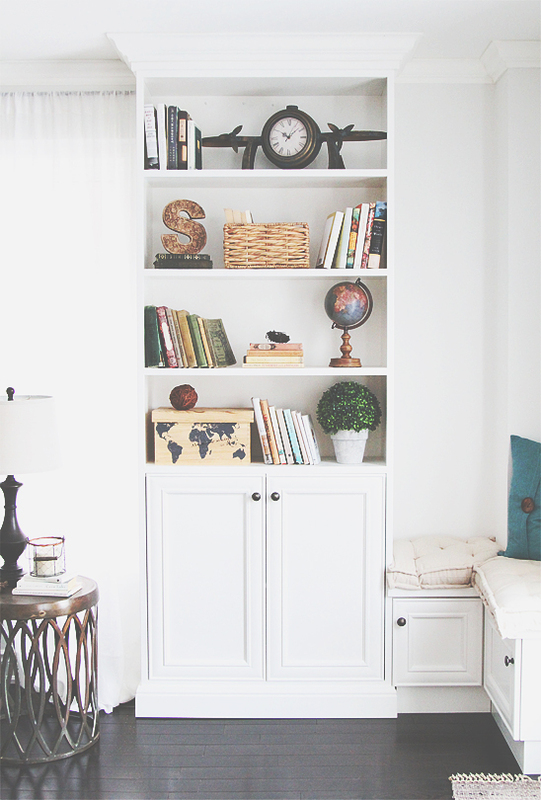 Book Case: This is the Cameron 4-shelf book case from Pottery Barn Kids. 6. Rug: From Wayfair.ca, literally delivered in 2 days with free shipping! Impressive. 7. Rocking Horse: From Amazon! You have to assemble it but it was easy. 8. Light Fixture: From Union Lighting. We wanted something that would age well as the baby grows up and I think it does the job well. We’ve bought a lot of our light fixtures from this store; the selection is absolutely mind blowing. Highly recommended! 9. White Linen Drapes: Pottery Barn for grown-ups. I’m obsessed with Pottery Barn drapes and won’t get drapes from anywhere else. They’re just gorgeous and super high quality. Not cheap by any means but worth every penny. She’s up and she’s a beauty! Hello, Christmas! :) I LOVE putting up the tree and playing some classic Christmas songs while doing it. We got this beauty up last night and it makes me happy every time I look at it. It’s such a treat and warms up the whole house. Love all her sparkle and shimmer and everything. It’s definitely the most wonderful time of the year. A busy time, but a wonderful time. I have the week off with Chris to do baby errands (it truly feels like a never-ending list) and Christmas shopping – it’ll be busy but nice! 1. 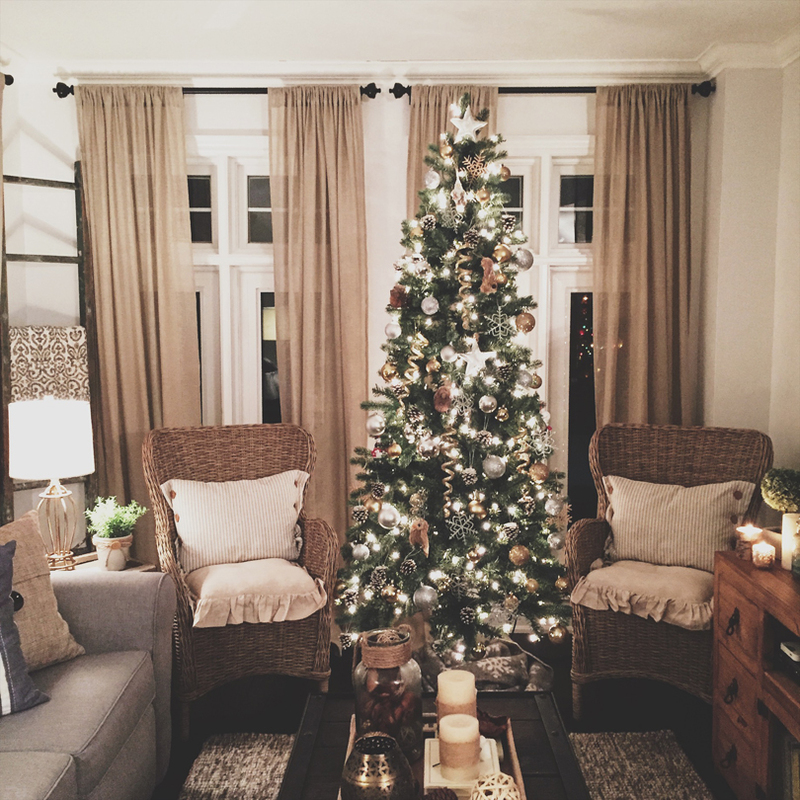 If you have a small space for a tree, slim trees are so key! (Not a short tree, a SLIM tree!) It could be tempting to just get a small overall tree but you can get away with a skinny tree and still get the glory of the height :). A short, small tree just does not look or feel the same. 2. Tree skirts are generally a miss for me. I don’t tend to love the designs that I’ve come across and quite frankly, they’re just too large in diameter that it would not fit in our small tree space. So instead, I found us a holiday throw/blanket and used that to wrap around the base of the tree. Works like a charm! Before buying your ornaments, you have to decide on a colour scheme. For us, we chose silver and gold with brown/wood-like accents. After that, it’s pretty much just picking the shapes and figures you like and love. Ah, so much fun! That’s it from me for now! I’m going to get back to watching Love Actually – best Christmas movie ever. I’ll be back in December for a baby bump update! I am sooo sorry for an unexpected, no-warning 3-month hiatus!!! Life got incredibly busy and the blog got abandoned for a little bit :(. I am BACK though. Also so excited to have finally taken the plunge on purchasing a new lens – the Canon L Series 24-70mm f2.8. I realize that sounded gibberish to many of you but it’s not just any lens, it is THE lens. Pricey as hell but also long overdue and a well deserved treat for myself after getting a promotion at work :) (You’re looking at the newest Marketing Manager at General Mills as of July). Yay!!! So happy. Now onto a decor update! The linen closet can either be an eye sore or a pretty place :). They can also be a chaotic dumpster or they can be storage (its intended purpose) where you can easily find things. Let’s be honest, no one likes to have to hunt things down around the house. And things are usually easy to find when they’re organized in some way. Here’s what we’ve done to our giant linen closet in the upstairs hallway. 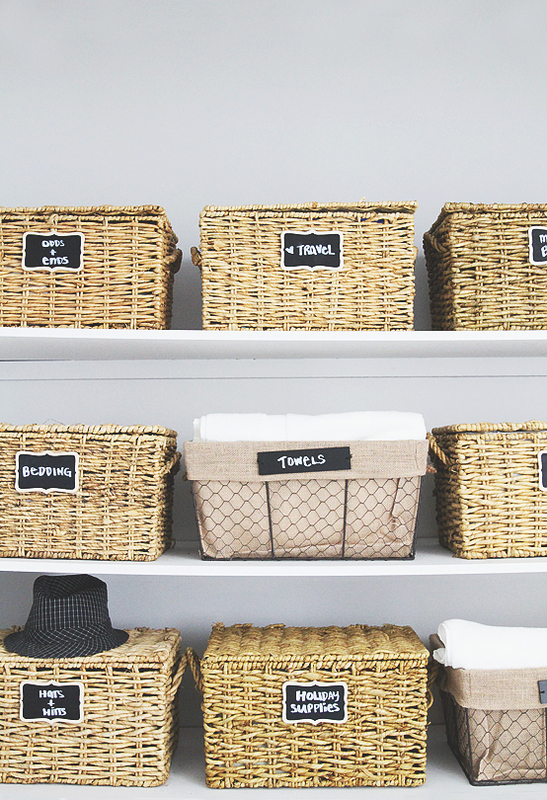 Organized things into wicker baskets with labels. We’ve been in our home for 2 years now and the closet has stayed exactly like this. Once things are in nice, organized boxes, you can’t help but keep it that way! 1. Think of your organization categories! Decorating a book case & a little reading nook! Here’s what our other ceiling-high book case looks like, on the other side of this book case. This one’s decorated slightly differently and has got more of a travel theme happening :) because we love to travel! 1. Generally, I’d say never to actually fill up a decorative book case with only books! I’m finding that book-filled book cases tend to be beautiful only in home libraries where there are tons and tons of books and together they look masterful. One-off book cases are best decorated with a little more! 2. Carefully handpick the few books that make it onto your decorative book case. Make sure they have pleasing spines with colours that complement each other! The trouble with books we DO have in our arsenal is that they tend to be business books that don’t have the right look and feel. So if like us, you find yourself having to buy books for decorative purposes, don’t be spending full price on them. Head to a Value Village or a second hand bookstore. There are plenty of gorgeous books, especially antique ones, to come by for $2-$3. 3. Keep some books sitting upright in the traditional way and others flat on their cover. A mixture looks great! 4. Then it’s a matter of adding accents like wicker baskets, storage boxes, block letters, clocks, plants, globes, and other such knick knacks that bring the book case to life. The most wonderful time of the year is here! That means pretty holiday decorations, especially on the dining table :). Here’s some inspiration! DECOR TIP: Things you need. Ditch the place mats and try charger plates. They really add a nice touch! There’s a great selection at Pier 1. No need to learn how to fold linen napkins in fancy ways! Just scrunch them up and tie them down the middle with jute ribbon! The little gold stem accents were cut out of a single larger twig stem from Michael’s. The pine leafs were also cut out of a single larger pine stem from Michael’s. (I LOVE Michael’s). And the snowy acorns were bought in a set of 12 from My Back Shed! 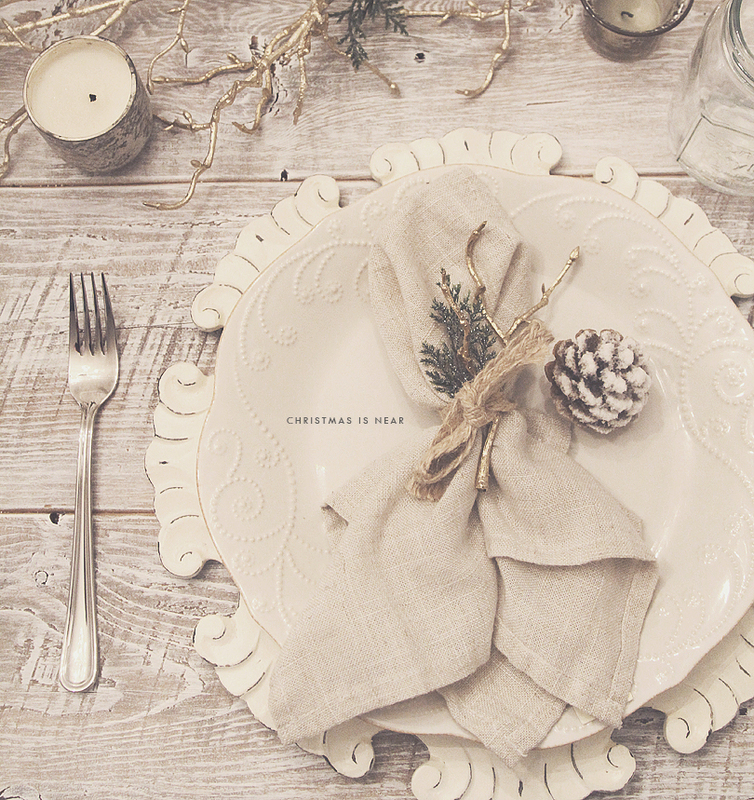 It is with these accents that we are able to bring the holiday spirit to life at the table! We bought these LENOX French Perle Plates from The Bay :). They also come in a really faint sea green colour and adds a variation around the table so the decor looks complementary rather than perfectly matching! There’s a lot to talk about in this picture but today’s post will be focused on how to decorate behind your couch in the living room / family room! If you’ve looked for picture ledges before, you’ll quickly learn that you can only find affordable ones at IKEA. The problem then becomes limited options. You’ve got 2 colours, black or white, and 2 sizes, small or large. 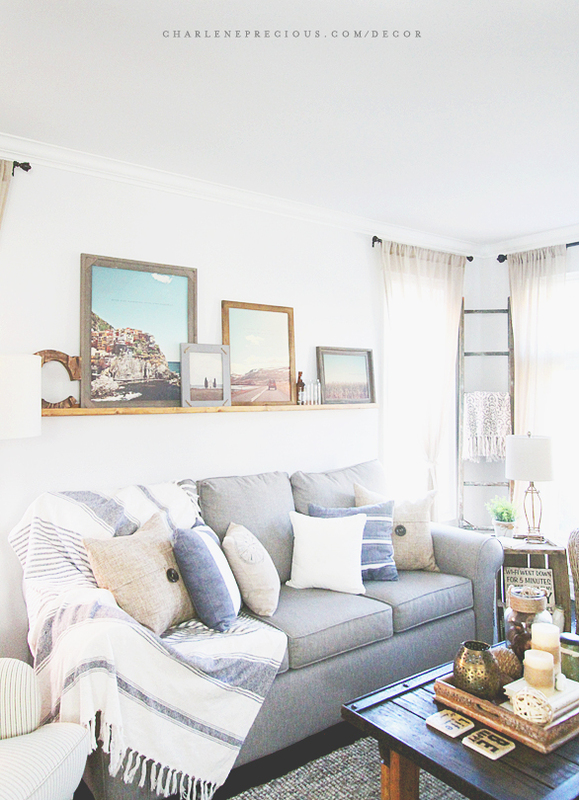 We wanted a rustic-style, wooden picture ledge and we needed it to be 90″ in length. The only place that came close to having something like this was Pottery Barn and of course, it was hundreds of dollars. (Don’t get me wrong, I LOVE Pottery Barn but it’s not the place for basics). So we said, let’s make this ourselves! For only $25 and 3 short hours, we built ourselves the exact picture ledge we wanted for our family room! The length is entirely up to you and what your space needs. If it happens to be going above your couch, then we’d recommend the length of your couch. Take these dimensions to Home Depot and they’ll cut the lumber for you right then and there. :) All you’ll need to do back at home is nail the 3 pieces of lumber together and stain it with Minwax Wood Finish. We used their Puritan Pine stain. On our picture ledge are our very own Manarola Cinque Terre, Iceland Road Trip, La Vitaleta Chapel, and Corn Field prints. The rustic frames are from Homesense. Not all of them were actual picture frames; some came from bulletin boards and mirrors. It’s about spotting the right frame! It doesn’t matter what it’s framing in its original state. :) As long as you can pop the frame out and use it for pictures, you’re golden. And remember, ditch the glass. Glass-less frames work best with our matte-finish prints! Of all the home projects, the closet was probably among the easiest and cheapest! DECOR TIP: Here’s all that you need to build a $500 low-cost yet pretty closet! Simply install this from one end of the closet to the other. You may need to throw in a support bracket in the middle if you have a lot of clothes that will eventually weigh the rod down! This is so you have a set of drawers to dump your clothes in! Extremely helpful to keep your closet neat. 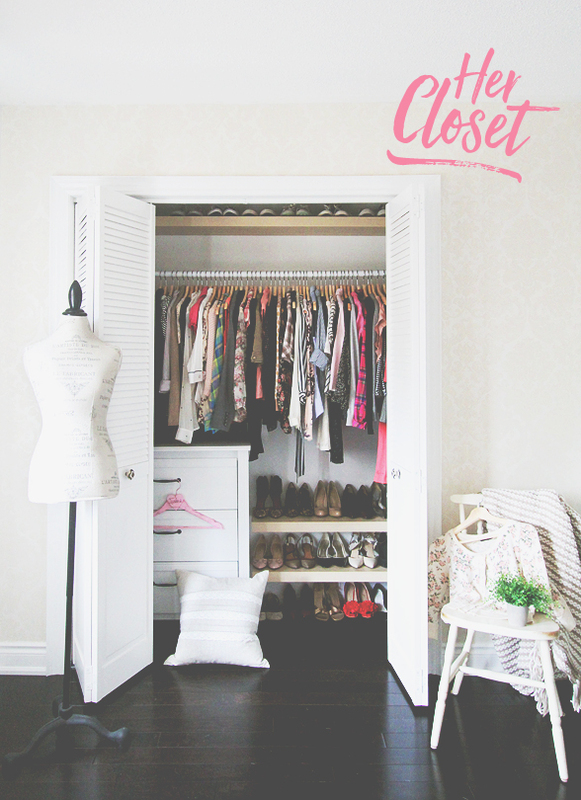 This is only if you care about having a “pretty” closet. Make sure your hangers match across the board – it makes everything look prettier and more organized! Miscellaneous hangers look messy :P.
This is an easy way to store your shoes neatly inside your closet. Again, pick colours that complement or match the rest of your closet. For instance, if my hangers are natural pine wood, then I’ll also pick natural pine wood for shelves! I love, love, love the look of shutters in general, so louvered-style closet doors were the perfect choice for me. I also love the bifold function because they are not only space-saving but they also look awesome!